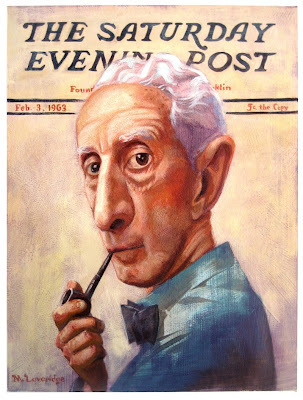 It is of my opinion that Norman Rockwell was one of the greatest painters, in both technique and story. I've always loved his paintings. I'd love any comments. I also share your opinion. Nice homage to Norman! He does ROCK, my opinion! I think Rockwell would be really pleased by your statement and your art. amazing work! i love how you manage acrylic. I do not entirely share your opinion of NR but your portrait of him is a keeper. Love the portrait. Saturday Evening Post coming into the house was a huge event and I grew up with NR. Having dropped out of art school at 62, I think I might just join you in saying NR was a great painter! I've always loved Norman Rockwell as well. I love how he captured everyday people doing every day things, but made them seem so much more than what they really were. Love your illustration too. Really wonderful and inspiring. My favorite illustration of Norm's is the one from the soda shop. this is lovely...you are very talented. I also love Norman Rockwell, especially for the story in his work! Work with a story captures me and won't let me go! Nice illustration. I got that one postcard, and the moment i saw it, i fell in love with it. and as you can guess, it was one of hes works. and now i am a big admirer.